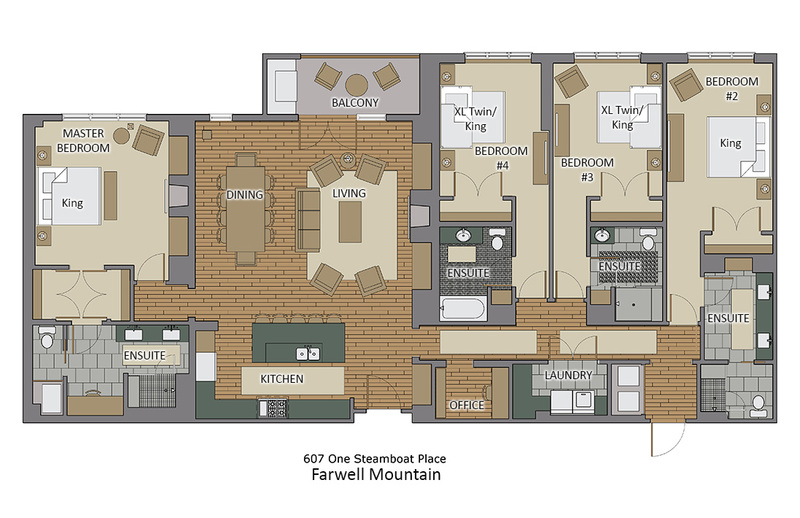 The Farwell Mountain Residence at One Steamboat Place offers luxurious accommodations for up to 10 guests just steps from the Steamboat Gondola. Offering the best location in Steamboat and unparalleled luxury this home is not to be missed. This spectacular One Steamboat Place private residence features a large living area with views overlooking the Plaza of the Steamboat Mountain village and directly up to the ski trails. The open floor plan connects the living and dining areas to the kitchen abundant space for the entire group to be together. Beautifully furnished and decorated throughout, this home is also equipped with high-definition a/v equipment to provide your entertainment after a full day of mountain fun. The iconic One Steamboat Place kitchen design is complimented by professional equipped kitchen with everything you need including Viking appliances. You can grill outside on the built-in Viking gas grill on the deck. A sunken countertop provides easy access to the sink and work surfaces. One Steamboat Place residences are designed for entertaining. There is seating for 10 at the dining table and room to seat more at the kitchen island. All One Steamboat Place residences feature rich colors, natural textures, and sumptuous fabrics throughout the home. Each master bedroom offers a gas fireplace. The main master bath features a flush entry shower and Jacuzzi tub. In this residence 2 bedrooms offer a King bed with private bath. The third bedroom offers a King bed and Twin bunk. The fourth offers a King with Twin bunk, all with a private bathroom. One of the bathrooms is fully ADA compliant. The home office nook boasts an iMac home computer and high speed Wi-Fi throughout the residence allowing internet service for all guests. A printer is available at the front desk and guests can also videoconference with the front desk from the home office. The property and One Steamboat Place are the perfect place for anyone looking for a luxury stay vacation. You won't be disappointed.